In the field “Industry 4.0” China is moving into the fast lane. Since 2013, Chinese inventors have filed over 2500 patents in this field, putting China way ahead of the United States (1065 patents) and Germany (441). China is not only ahead in terms of the number of patents, but has also developed highly innovative inventions. This is especially the case when it comes to energy-efficient wireless sensor networks and network structures – areas in which Chinese research institutions are making remarkable progress. Fraunhofer IAO will be publishing a digital technology study entitled “Chinese Industry 4.0 Patents” in twice-yearly installments starting in June 2015. 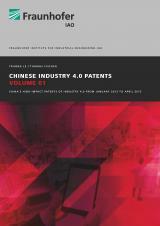 This study will evaluate some 1000 Chinese patents and examine the quality of the technology in the 50 most important Chinese patent publications for a six-month period, with the information translated and summarized in easy-to-follow profiles. This information is highly relevant for Business strategists, R&D, IP and Sales managers.